You can find out more about the Manchester Coffee Festival after the gallery, a brief tour of the venue. 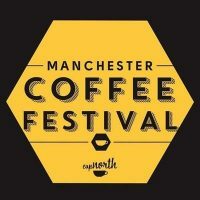 Back for its fifth year, the Manchester Coffee Festival will be in the Victoria Warehouse in Stretford, an easy tram-ride from the city centre if you’re coming by public transport. There is also car parking available for £5 each day. Having moved into the Victoria Warehouse in 2015, the festival returned in 2016, moving across the yard into a larger, more manageable space, where it’s been ever since. You can expect all the usual coffee festival fare, with plenty of speciality coffee and related kit from the numerous roasters and equipment suppliers amongst the exhibitors. There’ll be food, of course, with three local street food traders on hand, backed up by the likes of Coffee-Spot-feeders extraordinaire, Cakesmiths. For the last two years, the festival has been in the rear section of the Victoria Warehouse (turn right once you’re through the gates). The main entrance is on the left, past the outdoor street food village (always a bit of a gamble when you consider Manchester’s weather). Once inside, you’ll find the festival split over multiple, interconnected spaces, making it easy to get around the various stands, which line four sides of a large square, the middle taken up by the toilets. Entering in the bottom-right, two rows of stands run along the bottom of the square to your left, while on the right there’s a seating area for the various talks. The left-hand side of the square has another seating area, hosting the various events, including the Cup Tasters Championship. Finally, the top side of the square has another dual row of stands, with a further space beyond this, also with a dual row of stands. This layout is excellent, resulting in a very open space, with plenty of room, particularly between the rows of stands. It’s easy to move around: you can do a complete sweep in a couple of minutes, just by walking in a figure-of-eight. Even those stands tucked away in the corners or at the ends of the rows seem to be constantly busy. Roasters have always been extremely well-represented at the festival, providing the chance to catch up old friends such as local roasters Heart & Graft, Grindsmith and Ancoats, as well as Lancaster’s J Atkinson & Co. Meanwhile, coming from the other side of the Pennines are the likes of Yorkshire’s Bean Brothers and Rounton Coffee. Talking of other directions, heading up the M6 will be Shropshire’s Hundred House Coffee, Clifton Coffee Roasters (Bristol) and, all the way from Cornwall, Origin. London, meanwhile, is well-represented with more old friends in the shape of Allpress, Campbell & Syme, Climpson & Sons and Union Hand-roasted. Coffee equipment will be represented with the likes of Conti, La Marzocco and La Cimbali, who will also be running a special sensory school, new to this year’s Manchester Coffee Festival. Meanwhile, green bean importers, DR Wakefield, will be back with another packed schedule of coffee cuppings, an ideal way to explore new coffees from around the world. The Manchester Coffee Festival has always been strong on reusability with the likes of KeepCup and Therma Cup, plus Vegware, makers of full compostable takeaway cups. This year the festival has gone one better and, taking a leaf out of the Glasgow Coffee Festival book, it’s running a reuseable cup rental scheme in association with Keep Cup. For a small despoit, you can pick up a Keep Cup for the day and then either return it at the end in exchange for your deposit, or, if you liked it, you can keep it. Stepping back from the coffee, old friend Stephensons Dairy is back for another year, while if you’re looking for non-dairy alternatives, the likes of Blue Diamond and Oatly will be out in force. There will also be hot chocolate from the ever-present Kokoa Collection and multiple tea suppliers. Finally, the Festival will once again host a series of events, including Tamper Tantrum talks and my personal favourite, the Cup Tasters’ Championship. So, what are you waiting for? Get your tickets now! Hopefully I will see you all there. If you want a copy of my book, The Philosophy of Coffee, just track me down since I’ll have plenty of copies with me!